Beginning with the Transfiguration of Jesus in chapter 17:1, the Gospel of Matthew continues to reveal through Jesus' teachings what it means to be a disciple. 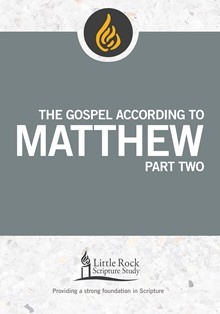 This second part of the study of Matthew reveals a growing tension as Jesus ministers around Jerusalem, is arrested, is crucified, and rises to new life. Revealed as Emmanuel (God with us) at the start of the Gospel, Jesus will promise his continuing presence as the disciples are commissioned at the close of the Gospel. Commentary, study and reflection questions, prayer, and access to recorded lectures are included. 4 lessons..